so it can be for the world again"
So begins this expertly written book by Ken Wilson, a pastor, practitioner and pilgrim to engage those drawn to the fascinating figure buried in the messy field of religion. Jesus Brand Spirituality is for those disillusioned by the current swirl of cultural conflict, moralism, and religious meanness that amounts to a form of trademark infringement on the movement that bears his name. Combining candor, curiosity and rare insight, the author explores four dimensions of the spirituality Jesus left in his wake--active, contemplative, biblical, and communal. Practical, engaging and compelling, this fresh illumination of an ancient path is both moving and thought provoking. Phyllis Tickle, founding editor of the Religion Department at Publisher's weekly calls Wilson "one of America's most gifted evangelicals, a thoughtful, unflinching pastor for thinking Christians; but he has outdone even his own reputation here. Candid, confessional, and full of stories, these conversational chapters from a man enthralled with Jesus are shot through with the passion and the realism of an eternally-vital romance." 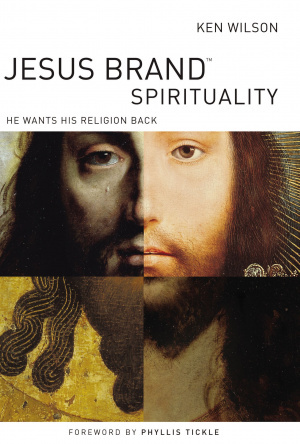 Jesus Brand Spirituality by Ken Wilson was published by Thomas Nelson in July 2008 and is our 23977th best seller. The ISBN for Jesus Brand Spirituality is 9780849921117. Be the first to review Jesus Brand Spirituality! Got a question? No problem! Just click here to ask us about Jesus Brand Spirituality.